The last day to debug before MGC! We’re heading over Friday morning to get set up, so by the afternoon we can relax. Bring my tabletop Neo Geo mini arcade if anyone wants to buy it. Made sure all timed modes award extra points for whatever seconds you had remaining on the shot. Fixed glitch where Extra Ball light would be on after a mode ends if you collected it during a mode. Added additional shift out for new GI lighting. This affected timing (since it’s always running) so adjusted timed light show on Multiball. Added more lightning FX for the animated backbox. Will add more after MGC. Fixed a bug where if ball didn’t trap successfully to start Haunted Bar the mode would get messed up. It now does a Dirty Pool detect, and if ball indeed trapped, starts mode. Else, targets go down so you can shoot it again to trap. We finished our episode project early, so I’ve got more time these last 2 days to code. You can open a serial terminal and send commands to the pinHeck system. Improving command parser. Felix is working on an Android tablet app that will allow remote debugging via Bluetooth. Will hopefully be able to have a small demo ready for MGC. Did Bluetooth test – commands working. Need to make command system more verbose & garbage sensitive but good enough for now. FINALLY found match animation bug problem! My file system is fairly stripped down, can’t follow cluster chains for instance. Usually not an issue as we copy entire SD card at once. The folder containing the Match animations also has a lot of other stuff in there. As I added files, the total # of files in that folder went past 64. 64 filename @ 32 bytes per entry = 2048 which must be past a cluster limit for FAT32. Thus, my system got lost and couldn’t find files near the end. That was the only DMD folder with over 64 entries so probably why I haven’t run into this before. Solution was to create a new folder (_DN) to hold the 10 match animations. Added bubble sort to high score entry, so best score is entered first. 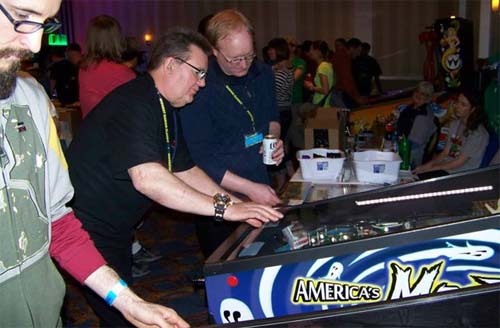 Found issue where multiball starting AND ending during stackable modes could cause wrong music to play. It’s audio video day on Debug Week From Hell. I can only program so long as I must do laundry tonight, meaning I have to be home, awake, for at least 2 hours. Might take a Titanfall break. Working on name entry bugs – transitions from name entry screen to Match screen back to attract mode. Working on high score EEPROM write bug. Speeding up time between last ball drain and name entry / Match animation. EEPROM appears to be fine, it’s the final videos of a game / transition back to Attract Mode that is mucked up. Time to un-muck. Need to get more sleep. Will try and goto sleep by 10 PM tonight. We’ll see. Making sure Extra Ball being lit doesn’t negatively affect Spooky Door logic in any mode. EB can only be lit during some active modes, but it MIGHT be lit going into a mode, so we have to assume that could happen. Making sure earning a Multiball during eligible modes doesn’t affect door logic. Noticed that multiballs can be “carried out of” the Army Ghost mode. Not sure if that could break the game or not. Maybe allow as many hits on Army Ghost as you want (instead of the usual 3) as long as you’ve got 2 balls or more? That could be cool. Found glitch where Spirit Guide (Stroke of Luck shot) isn’t enabled after defeating Hotel Ghost. Glitch made me realize the spiritGuideEnable() function had a critical error where it could actually DISABLE spirit guide if you enabled when the player didn’t have one earned. Found glitch where leftmost camera icon stays on after Hotel Ghost. Think it might have something to do with active combos stored along with lamp state at start of mode… Yup that was the problem. Hotel Mode was the only mode that called storeLamps BEFORE comboKill, so we’re good to go now. Stacked MB jackpot increase with Ghost Euthanize mini-mode shot for Hospital Mode. Fixing final glitches with Hospital Ghost Mode. Turns out of you have a Windows 8 laptop with touchscreen, you can go back and forward in Chrome by dragging your finger left and right across the screen. That’s kinda cool. Hellavator MB working well. Fixed glitch where Minion Targets were erased on Hellavator MB start. Improved end of mode code for Photo Hunt. If I have time, might re-stack it with Ghost Minion Mode. Ah, the umpteenth consecutive Saturday I’ve been at my shop working. Realized using same variable for # of locked balls and how many balls to autolaunch was really stupid. Think I know why that combo light is staying on! That’s what happens when code gets too old – you forget what did what. Probably won’t enable Wizard Mode or Video mode for MGC – more important that the 99% of the game people will actually see works perfectly! Found glitch where Minion Multiball ending would prevent Spirit Guide from being collected until another mode started – whoops!